This is Commercial Link When it comes to your business, nothing matters more than staying one step ahead. And Commercial Link helps you do just that! It's all thanks to our simple and easy vehicle management system offered through OnStar that helps you keep your business running at maximum efficiency. Available 24 hours a day, 7 days a week, and 365 days a year. Simple-to-read charts and graphs. Easy access to reports. Available vehicle location tracking. Maintenance alerts and more. Customizable dashboard. Set up alerts to stay informed. Commercial Link is a simple, yet powerful, system that helps you manage your vehicles in one easily accessible place. 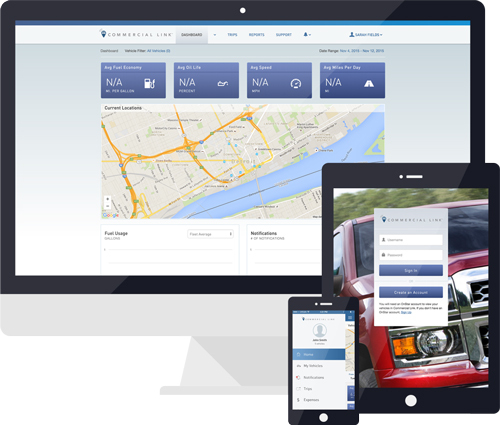 Track any of your vehicles and even view their location history, all from your mobile device or computer. If there's one thing you can appreciate, it's cost savings. Monitor your vehicles' fuel consumption over time with the help of fuel efficiency reports.